It was the busiest stretch of work all year, but last week also brought with it one of the most significant and historic events to ever grace the facility I work at. It was a thrill to not just witness it.....but to realize just how rare and special the moment was as it was happening. It was pretty cool. And now, it feels like we've shifted into fifth and are settling in the for the final push. In the meantime, hockey season will hit full swing - and I can't wait. I managed to hit up the local trade night tonight and walked away with a few great gifts. It was exciting to say the least. The generosity in others never goes unappreciated - and I never take those gestures for granted. And to add to the great night....I got home to an awaiting bubble mailer that I was not expecting. Inside was card and a letter. The card speaks for itself. A beautiful high grade Linden rc. I have a PSA 10 OPC and Topps sitting in my collection and am always on the lookout for a pristine Beckett 10 (which I don't even know if one exists). A 9.5 has been on the radar for years....but I just never pulled the trigger on one. Recently I saw a copy show up on one of the hobby boards and I inquired about it. I don't know if his response (which was a little on the odd side) was to smokescreen me into being patient while he shipped it off....but needless to say I was stunned to see it in my mailbox - just because. I mentioned a letter was in the package too. It really made my day for the sender to share a bit of his story regarding the card. I also really appreciated the kind words towards me and also towards others who have been equally selfless in the past. So a hearty THANK YOU to you Matt for the great gift. It will sit proudly in my collection and have a fitting story to anyone who looks at it. It was this Linden that really kicked off the night. 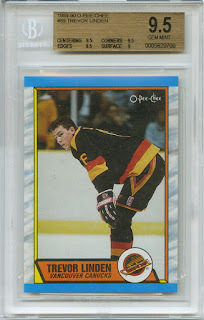 A pack-pulled beauty from the most recent OPC offering. Four packs....and this found its way into one of them. 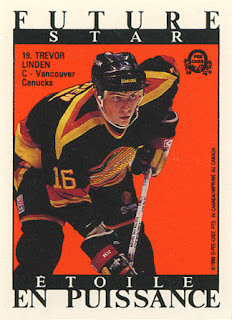 I must say, I got a little excited when I saw the black border....and even more thrilled when I saw the name "Linden". But I must have had a silly strawberry ice cream grin on my face when it was simply slid my way. 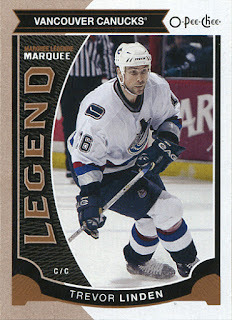 Another hearty THANK YOU to Captain Canuck for the great card - and for opening up some OPC tonight. Good stuff. The base even found its way home with me too. It might just be a worthless base card to some, but to me it is more. THANK YOU Rob for the gesture. Always a pleasure. Yes, it too was gifted to me tonight. And massive bonus points to anyone who can name both players without checking. I'm going to go with Derek King and Reed Larson. So what makes this item so special to me? 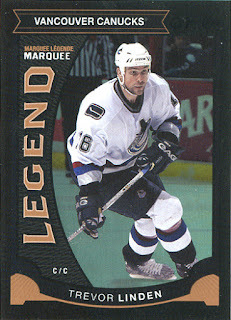 Why did someone keep it aside in their trade box with me in mind? 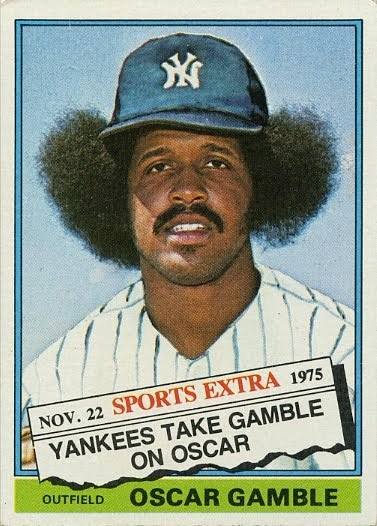 Well, it's the flip side of the card. 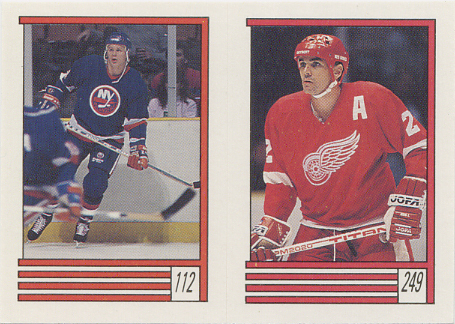 Yes, this is the "sticker-back" card from the 1989/90 sticker set. 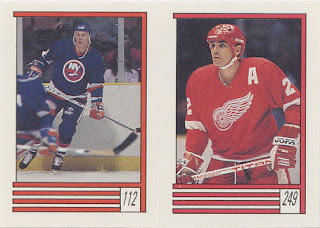 I had the books back in the early-to-mid 80's and loved buying packs, sticking in the stickers and trading with friends - hoping to fill the book before the end of the season. This flipside Linden though is a little bonus fun. You could stick the stickers and still have a card. Genius. And look at that jersey. Love the shoulder "V" flares which also show up on the pants (those would be a cool game used pair to own). While I already have this card in my collection, I will be swapping it out with this new copy - and have yet another great story to tell. One more THANK YOU to "The Baron" for thinking of me. I really enjoy this card. Thank you to everyone who has been selfless or generous or helpful to me, my collection or to anyone out else out there. While this can seem like a cutthroat hobby at times (and geared towards those with deep pockets), there are many instances where a simple act can flip things around completely. NOTE: I just checked. I was 0 for 2 on my guesses. Anyone that gets them without cheating will be on another level....they are tough. Mike O'Connell and David Popat? The NYI player is Mikko Makela. You're bang on with the Mike O'Connell though.